Konen was a happy little boy. He’s my middle child, 9 pounds 10 ounces and 22 1/2 inches long. He loved life and everything it had to offer. He was outgoing and energetic as most 3 year olds are. He loved being outdoors and playing in the dirt. His 5 year old brother was always at his side. They were partners in crime and best buddies. They weren’t easy to separate. You would hardly see one without the other. He loved spending time with us and playing in our small pool with his brother and sister while I would sit outside with them while they played. He had such a contagious laugh that it was impossible not laugh with him. 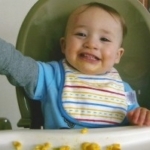 He loved food, any kind of food. Just give him something and he was happy. We also called him a little fish. He drank juice or milk like fish need water. He always had something to drink and as soon as it was gone he wanted more. I always called him my wild child. He wasn’t scared of anything. He would do anything he set his mind to. He loved animals. All dogs, as we had 6 family dogs he has always been fond of every single one of them. He was a little charmer. On Sunday December 15, 2013 it was a normal day. We woke up and went to church. After church my husband and I and our 3 kids went home ate lunch then we took the kids to the lake, which also had a playground. The kids had so much fun there. We took lots of pictures and they ran around and played. It was getting late so we went home. The boys were still hyper and asked my husband if they could go in the backyard and play as they normally did with our family dogs. Konen still had his jacket on so he was outside first and his brother was behind him putting his jacket on while walking out the door. My husband and I were only 10 feet away when we heard our 5 year old screaming as he was running in the back door. We ran as fast as we could to where he was pointing toward his brother in the back yard and I seen our pit bull (Odin) chewing on his neck. 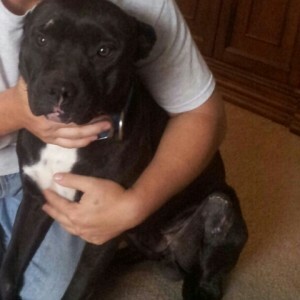 My husband was the first to run toward my son and the dog ran off and cowered down. Our dog knew what he did was wrong. My husband grabbed the dog and took him away. I looked at my son and he turned over and looked at me for a split second and then dropped his head to the ground. I ran to him and picked him up. I put my hands around his neck instantly because that’s where I seen our pit bull biting him. I felt the hot blood squirting out on to my hands. I was screaming for someone to call 911. I couldn’t let my son die in the back yard so I picked him up and ran inside, laid him on the counter and called 911. His was blue. Like a blueberry. There was blood coming out of his mouth and his tongue was between his lips. He was gone. I could feel and see his lifeless body. They guy on the phone walked us through CPR and my husband continued till the ambulance got there. They kept him in the ambulance for a while and we weren’t able to see him. Finally they told us to follow them to the hospital. We got to the hospital and we had to wait in the waiting room while they worked on him. It was the longest wait of my whole entire life. Finally they came out and told us he was stabilized and we were able to go back and see him. 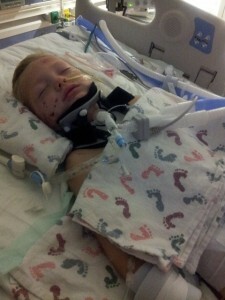 But that he was going to be air lifted to Dallas Children’s hospital because the injuries to his neck were to severe. When we went back to see him it was so scary. He was lying on the ambulance bed and they had him all covered up so we couldn’t see anything but his face. They were bagging him so he could breathe. (They had a tube down his neck breathing for him.) My husband rode with him in the helicopter and I was right behind with my 2 other children. When we got to the hospital they took him to surgery which lasted about three, three and a half hours. Because the damage to his neck was so bad they had to do a tracheotomy. We were able to go back and see him. It was horrible. All the machines they had hooked up to my baby boy. 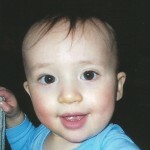 A machine was breathing for him through his trach. He had multiple IV’s and a neck brace. He had a feeding tube down his nose so he was able to be fed formula. The only injury I was able to see at that time was the bite marks on his face and right shoulder. He had a tube going to his right lung to drain the fluid he had after suffering a collapsed lung and a drain tube in his throat. The next few days he suffered from a stroke and a seizure. The stroke caused the left side of his body to be paralyzed. We later learned that the stroke was caused from a blood clot. The arteries in the right side of his neck were ripped completely apart. They put him on a blood thinner and seizure medicine so he wouldn’t have any more seizures. His head was purple and swollen from the brain damage that the stroke caused. The C1 and C2 bones in the back of his neck in the spine were fractured. He had an IV going from his arm almost to his heart so that he could get multiple medicines at once. When they took his neck brace off for my husband and I to see the injuries to his neck we were shocked. The damage to his neck was so horrible. It was so much different than we had expected. It wasn’t just bite marks. It was almost a straight slit in his throat from the back of his neck to the front where his tracheotomy was placed. He slowly came too and was able to stay awake. He started breathing on his own. Walking and talking. And after about a month he started talking and eating again. Then almost two months of being in the hospital and Rehab we were able to bring him home. Our home life was so much more difficult. We had to give him 3 breathing treatments a day 7 times a day. A shot twice a day and the seizure medicine twice a day. And two stool softeners incase he cannot use the restroom. We did trach care once a day and trach change every 7 days. On March 20th, 2014 he got his neck brace removed because his fractures had healed, and March 22, 2014 he was admitted back into children’s hospital and he got his trach removed. 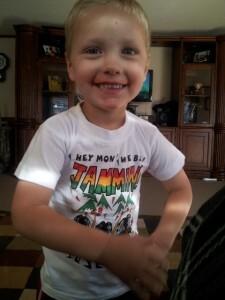 He is still the most amazing 3 year old I know. He is still happy and outgoing. He loves to play with his brother and sister. He loves life. He has moments of weakness where he just hates himself. Tells me he looks like a monster and that he isn’t Konen because of the things that happened to him. He has a different personality and things are harder for him. He forgets easy. He has issues seeing. But He still drinks like a fish and he still plays as hard as he use to. He has suffered from some anger issues. But who wouldn’t be angry after something so horrible happening to them? I live with that night every day in my head. It hurts so much. His scars hurt me even more. My 5 year old gets horrible nightmares because he seen it happen to his brother. He has seen the full affect and it’s stuck with him. Life is more difficult. But I have my son. I couldn’t be happier that he was able to survive this horrible nightmare that we had to go through. He deserves the world and that’s exactly what he’s going to get because he wasn’t going to give up and our lord was on my precious son’s side. We thought he was going to be a great dog. He acted like one. He was a good example of a good pit. Until he just decided to attack. He slept in our bed and everything. We never left the kids alone with him. They were never mean to him. We had 5 other dogs including another female pit and they never fought. But we had just moved to Jacksonville when it happened. So it was our pit our female lab and female weenie dog. And we lived with my husband’s aunt and she had a girl weenie dog and a girl schnauzer and a boy schnauzer. I don’t know our purpose for this. I just know I want to make a difference in this world. I want to save another family from the pain and heart ache of something so terrible. 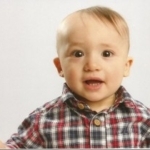 I want my son’s story to be heard. I want every victim’s story to be heard. It’s NOT the way they are raised. Our dog was well loved and raised. He obeyed all commands and never showed any aggression. These myths almost cost my sons life. How many more people have to get hurt because of a lie? I shared this on my Facebook page. I see so many parents say their pit bull would never attack. This story proves it cannot be determined which pit bulls will turn and which ones will not. Even when they are raised with love, they can turn. I am so glad you have your little boy still. Thank you for sharing your story. If states could prevent BREEDERS from producing this dog, and the pits and pit mixes already born could all be sterilized, kept separated from the public and wear a muzzle 24/7, maybe , just maybe there could be some control on this unfortunate breed of dog. In my opinion, the Breeders of this dog are the ones with innocents’ blood on their hands, and from reports they, for the most part, couldn’t care less about the victims or the pets of others that have been destroyed by this breed and their halfbreeds. 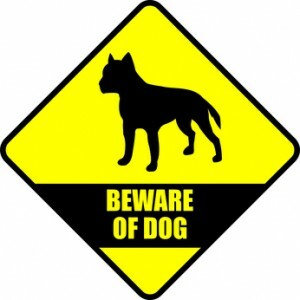 The poor dog is simply acting on instinct – genetics do tell – and it is a crying shame that thousands of these poor dogs are euthanized each year for not reason except their genetic makeup. YOU SIMPLY CANNOT DELETE INSTINCT OUT OF AN ANIMAL. BREEDERS ARE THE GUILTY ONES!. For the little bit of money they make on selling these prolific pups, they could care less about what happens with these unfortunate pups – just the $25. they get in their pockets.